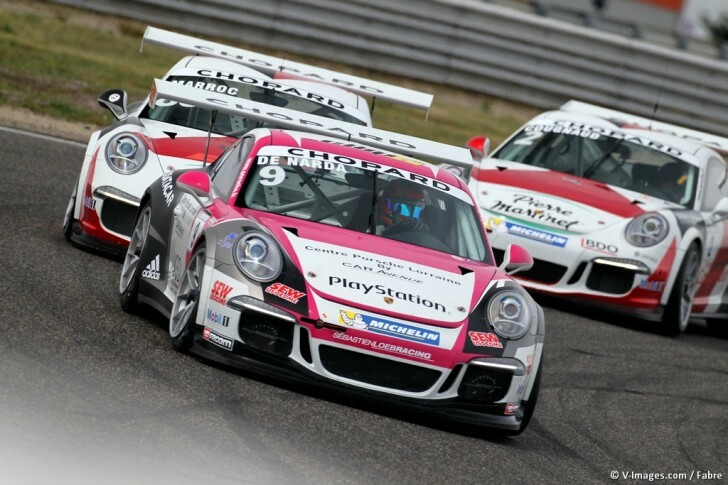 The Sébastien Loeb Racing is confident in approaching the second round of the 2015 Porsche Carrera Cup France, taking place at the Bugatti Circuit in Le Mans. However, revenge is also on the menu. While Maxime Jousse who had clinched the pole unfortunately encountered bad luck just before the beginning of the first and only race in Lédenon (the second race had to be cancelled due to bad weather conditions), the team from Soultz-sous-Forêt had the opportunity to enjoy Joffrey de Narda’s promising Top-5 as well as Roar Lindland & Christophe Lapierre’s double in the B-class – the latter actually achieved the feat of qualifying in the first row. It is thus with high ambitions that drivers and technical team will be attending Le Mans this weekend. There is a great chance that Maxime Jousse encounters teammate Joffrey de Narda on his way, as his performances around Nîmes’ hills showed he is there to win too. Let us remember that in 2014, for his first participation in the championship, and only 18 years old at the time, de Narda led the race ! Christophe Lapierre will also be there with the intention to compete at the top of the B-class leaderboard. Three times class champion, Lapierre’s most recent race consisted in a first row, a five-lap leadership and ended up in a class win. His teammate and first rival Lindland also plans on success. “I think that I could have performed better in Lédenon, but Christophe was very fast and I’m happy to have contributed in a double for the Sébastien Loeb Racing”, explains the vice-champion. “Beginning a championship like that is always very positive. It’s a shame that the second race got cancelled, especially because I love rain ! I’m looking forward to racing in Le Mans and to being back in the car on that track which I’m now quite familiar with. As part of the GT Tour’s second round, Sébastien Loeb & Dominique Heintz’s team will face the qualifying at 08:40 in the morning on Saturday May 2nd, then a first 35-minute race will begin at 03:20pm. On the following day, Sunday May 3rd, the timed session is scheduled at 08:00am while the final 25-minute sprint will start at 14:05pm. If you don’t want to miss out on anything, go to the Sébastien Loeb Racing’s official website to follow a live streaming of the event.